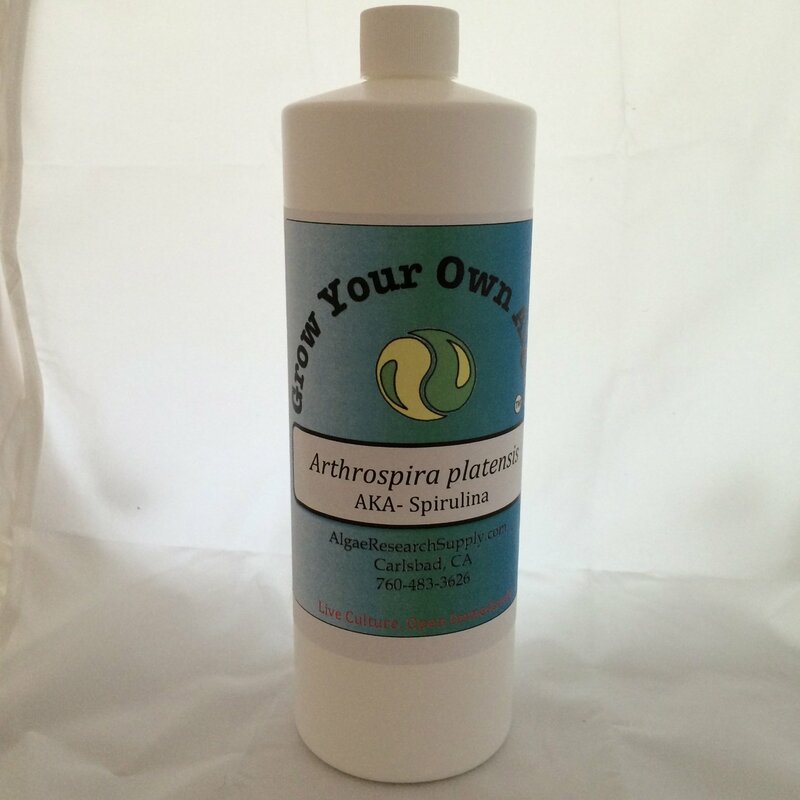 If you are serious about your spirulina you may want to give growing it a try yourself. Trying to grow spirulina at home can be difficult if you don’t know what you are doing or don’t have the right materials. If you are interested you should seriously consider this at home spirulina growing kit. 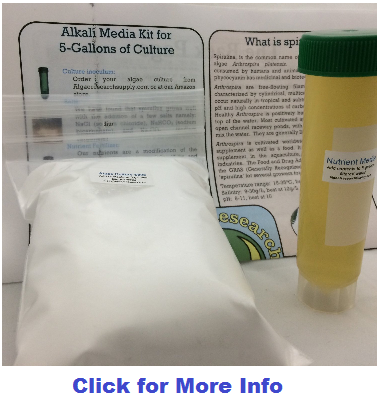 This kit is exactly what it says it is, a media for you to grow your spirulina in. The nutrients it includes is exactly what spirulina needs to grow healthy and strong. They are NOT just a mix of nutrients that MIGHT work. They are carefully selected and are based upon the algae media developed by (Aiba and Ogawa 1977, Schlösser 1994). The salts that are in the mix consist of sodium carbonate, sodium bicarbonate, and sodium chloride. These are important for making the water alkaline which spirulina grows in best. The media here will give you high growth rates with the spirulina and it will help maintain replete nitrogen concentrations. This will lead to high protein concentrations within the spirulina. There are instructions included in case you get stuck, but the process is pretty simple.All you will need to do is mix the ingredients provided in 5 gallons of non-chlorinated water. So you are going to need something that can hold 5 gallons. And a bucket is not a good choice. You want something like a fish tank, or a large clear plastic container. You want something where light can get in. Because if you don’t know, spirulina uses photosynthesis and needs sunlight. You will then need something to keep the water moving slightly. A small air pump or air bubbler that is used for fish is what works best. Not only does it keep the water from becoming stagnant, but it provides that water molecules from the air, such as CO2 which spirulina uses. The last thing you are going to need and the MOST IMPORTANT of all is spirulina of course. And no unfortunately you can just dump some spirulina powder in the water and wait for it to grow. That spirulina is no longer alive. You will have to buy cultured spirulina. Or if you live where you can get spirulina from a natural source that will work too, but I would be VERY cautious of contaminants, pollution, etc. I wouldn’t recommend it but I’m just saying it would work. There isn’t a “just right” amount of spirulina culture that you need to get. If you don’t get much that just means you will have to let it grow and reproduce longer in order to fill up the tank. Whats a good spirulina culture product? The same company (Algae Research Supply) that makes the spirulina media kit above also makes quality spirulina culture. They sell 1 liter of concentrated culture that is well taken care of and would be great for 5 gallons of water. Its cheapest on Amazon.com for ~$40. I know thats a lot of money and it might be out of your price range, but there isn’t really and “cheap” spirulina culture available. Thats a lot of growth in my book. I would say its worth it for the experience alone, but if you are just doing this to eat the spirulina I would say it isn’t. You could just buy spirulina powder for cheaper and you wouldn’t have to deal with the whole growing process. These products are often purchased by schools for science projects and things of that nature. They are quality but they are expensive. And if you are only using them on a very small scale such as that of growing it in 5 gallons, the spirulina that grows does not make up for the price paid. But if you are into trying things like this on your own then GO FOR IT! It think it would be a fun little project to try and see how good of spirulina you can grow. If you don’t want to bother anymore with this kit then I’m guessing you may want to buy ready to eat spirulina powder. If you have any questions about this kit and growing spirulina on your own, just ask below and I will help you. NextEarthrise Spirulina Review – How good are their spirulina tablets?